Home / Entertainment News / PHOTO! Rowdy Nairobi MCAs took Jack Daniels & White Cap before they went to eject ELACHI from office. PHOTO! Rowdy Nairobi MCAs took Jack Daniels & White Cap before they went to eject ELACHI from office. Tuesday, September 11, 2018 - There was drama after rowdy Nairobi MCAs stormed the office of County Speaker, Beatrice Elachi, and attempted to remove her from office. Elachi was impeached last week after 103 MCAs voted in favour of a motion moved by Waithaka Ward Representative, Anthony Kiragu, which sought to remove her from office. However, High Court reinstated her moments after she was impeached. 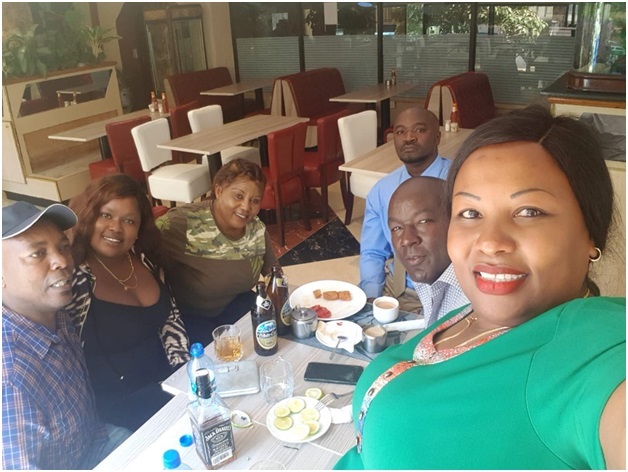 A photo of the rowdy MCAs taking Jack Daniel and White Cap before they went to create chaos at Elachi’s office has emerged. The lady taking White Cap is the one who was sprayed with pepper by Elachi after she stormed her office and attempted to eject her by force.